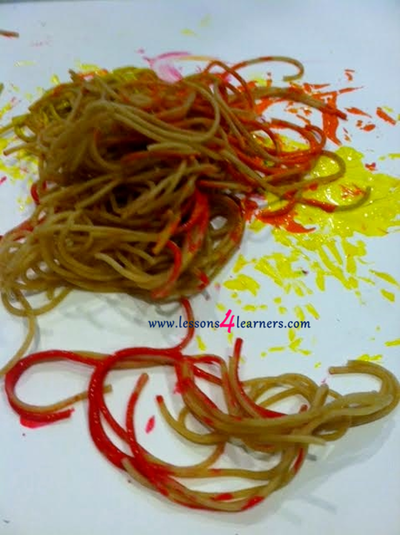 * Lesson plan objective and assessment can be adapted to use this activity with toddlers or preschoolers. 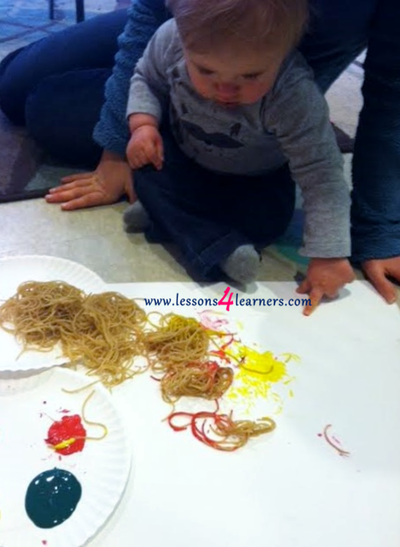 Place spaghetti noodles, paper, and paint in an appropriate area for the child to create. Invite them to join you. 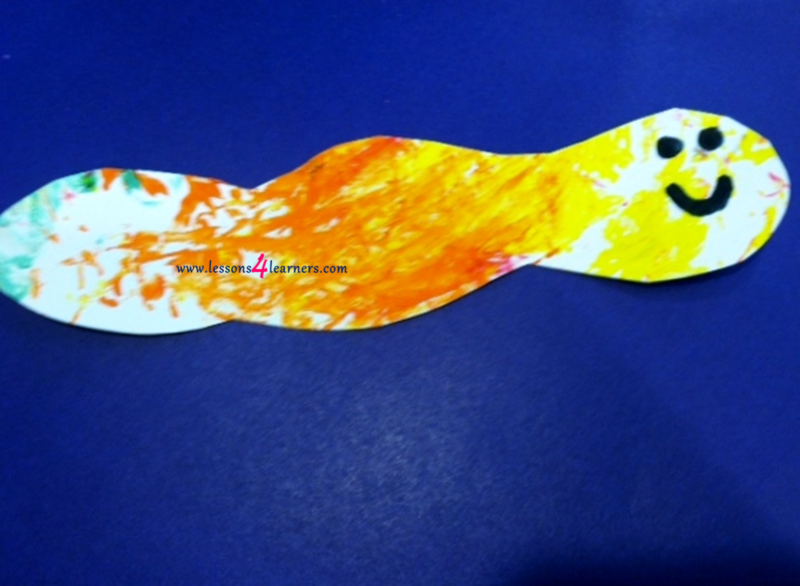 Show them how to dip the noodles in the paint and transfer the color onto the white paper. While they are creating, ask them questions about the process. You can also introduce new vocabulary relating to the activity like the names of specific colors they use. 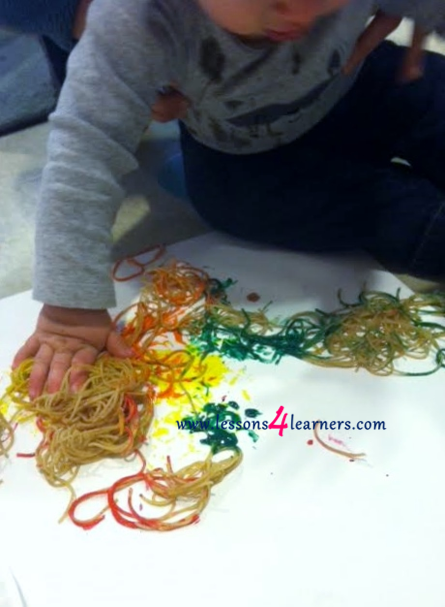 Observe and record how the infant uses the noodles to create. Click on the photos to enlarge. Click on the course icon for enrollment information. The development of creativity and imagination fall right into these developmental stages. So how can this understanding effect the way we interact with infants and toddlers? How do we best create an appropriate environment that enhances the development of creativity and imagination? From birth to 18 months, infants can be allowed to explore a variety of household items. These items should include a variety of textures, colors and even scents. For example, a plastic container that held cinnamon or vanilla will hold those scents for a long time. Things that make a sound when shaken are always fun. These inexpensive or even free materials are toys to young children. Concentrated juice containers roll, small margarine containers with some rice or beans inside and the top well-secured make great rattles. A clear plastic bottle with some oil, water, glitter and maybe some food coloring (with the lid securely glued on) can fascinate a baby and spark those brain cells controlling curiosity and wonder. Remember to include safe items from nature. Pine cones and leaves can be safely given to a supervised 9-month old. Remember that the mouth is the number one way that a young infant explores so be sure that the materials you give him are large enough, safe, clean, washable or disposable. ​Click on the course icon for enrollment information.